For many years I have been going, on and off, to open figure drawing and painting sessions here in Phliadelphia at either the Philadelphia Sketch Club or the Plastic Club, two of the country’s oldest arts organizations. 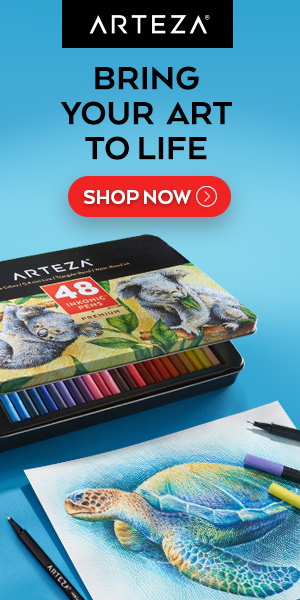 These are not classes, per se, with a set course of instruction, but simply sessions where artists jointly pay a model fee and are free to pursue figure drawing or painting in the medium of their choice. The sessions consist of a series of long and short poses, usually over three hours or so; and there is no requirement to sign up for a formal class. You can attend when it’s convenient. Hopefully, you have access to similar sessions in your area (they are sometimes part of the continuing education offerings of art schools). There is a somewhat similar artist organization, or club, in New York called the Painting Group. It’s a little different from most in that it has a closed membership and is led by the renowned caricaturist and watercolorist David Levine, and the highly regarded portrait painter Aaron Shikler, who counts among his portraits the official portraits of John F. Kennedy Jackie Kennedy and Nancy Regan. They have been meeting regularly as a painting group for over 40 years. 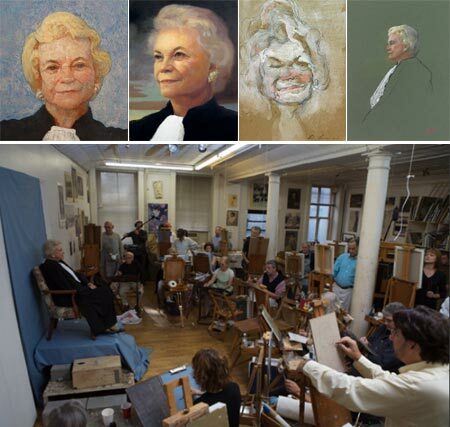 Last October Supreme Court Justice Sandra Day O’Connor sat for the group in a unique full-day portrait session, resulting in a fascinating situation in which 25 artists painted her portrait at the same time. You may have seen mention of it on the CBS Sunday Morning magazine show a few weeks ago. There is a slideshow online on the NPG site of seven of the portraits and a couple of photos of the session. I have to say that I was pleasantly surprised and liked it much more than I anticipated. Part of that is due to the design work, adapted from concept drawings by William Joyce, who wrote and illustrated the children’s book A Day with Wilbur Robinson, on which the film was based. Joyce is also the author/illustrator of several wonderfully idiosyncratic children’s books, including Rolie Polie Olie and George Shrinks both of which have been adapted for television animation, Bently & Egg, Santa Calls, and the terrific Dinosaur Bob and His Adventures with the Family Lizardo (interior image here). The production design on the film owes a lot to concept art by art directors Robh Ruppel (who I profiled last October) and David Goetz. Ruppel has finally begun posting some of the production art on his blog, The Broadview Blog. I found some other production art for the film scattered about on the Unofficial Disney Animation Archive and CanMag. There is a small book of The Art of Meet the Robinsons; and you can also see some early production art for the MtR game on San Neilson’s Tasty Art blog. 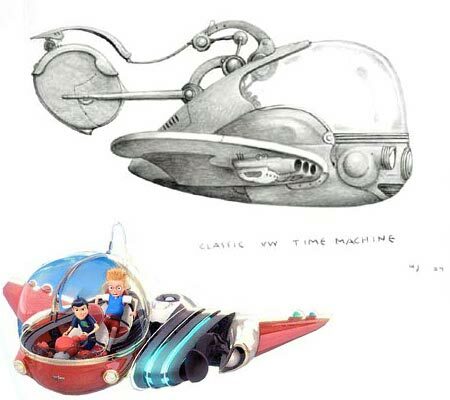 As much as I like the wonderful 1930’s retro-future, art deco meets the Jetsons by way of Flash Gordon look of the film, I can’t help but think how much better it might have been if the production team had been able to cleave even closer to Joyce’s charmingly quirky production drawings. Word is that the Disney execs wanted to change the title to “Get Lewis”, so you can imagine that they were pressing the production artists to make the design less original and more like other successful CGI features. A lot of Joyce’s originality comes through, but once you apply that standard CGI sheen over everything, it loses some of the visual charm it might have had if it were, dare I say it, a traditional drawn animation. Joyce’s site has some of his original concept drawings for Meet the Robinsons, (above) along with some renderings from the final movie (inset) that you can compare. Unfortunately, I haven’t found any kind of gallery of his illustrations or concept art for other films, but I may not have dug hard enough. There is, however, a book called The World of William Joyce Scrapbook, that includes some of his illustrations in the working stages, as well anecdotes about his childhood, sketches and photos. There is an info page about Joyce on the Harper Children’s site, along with a page about the books themselves. There are some short video interviews with Joyce on the Reading Rockets site. It’s remarkable how much of our picture of history is formed by generalized impressions. There is an impression, for example, that Claude Monet was the central figure around which the revolutionary painting style of French Impressionism formed; as it crystalized out of the pioneering Realism of Gustav Courbetand the incisive directness of Camille Corot and the Barbizon school amid the social turmoil engendered by Napoleon III’s military campaigns and the rebuilding of Paris. The assumption seems to be that Monet was the “father of Impressionism”, when, in fact, it was Camille Pissaro who was actually called “Père Impressionism” by his colleagues (particularly Cezanne and Gaughan, to whom he was a mentor and father figure), and who was as instrumental in the creation of Impressionist technique and theory as Monet, if not more so. With the exception of a brief fling with Pointillism, Pissaro probably remained truest to the Impressionist techniques that he helped to define and refine, and was the only one of the original group to exhibit at all eight of the Impressionist exhibitions. Within the refinement of that technique, however, his restless explorations of methods for applying paint, using brushstrokes, and searching for the Impressionist ideals led him through wonderful variations in color, paint surface and subject. Pissarro’s brilliant, sparkling canvasses are all that we have come to expect from Impressionist painting, full of those wonderful splashes of pure pigment, energetic brushstrokes, brilliant color, and dazzling light captured from plein air painting in the French countryside. 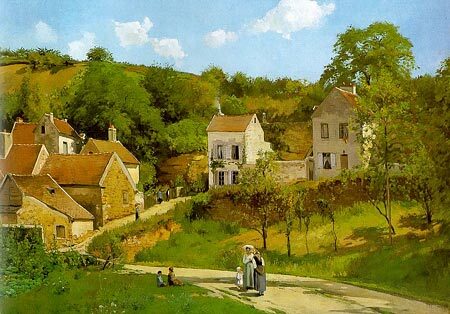 There is currently a rare opportunity, however, to see Pissaro and Impressionist painting in its nascent stages, when the first colorful buds were blossoming on the tree of French landscape painting. There is an exhibition of Pissarro’s work, Pissarro: Creating the Impressionist Landscape, curated by Baltimore Museum of Art, that focuses on his early work and the development of Impressionist technique out of his roots in the traditions of 19th Century landscape painting. The show is only at the Baltimore Museum until May 13th (sorry about the short notice) and then moves to the Milwaukee Art Museum in Wisconsin for a run from June 9-September 9, 2007, and finishes at the Memphis Brooks Museum of Art in Tennessee from October 7, 2007 to January 6, 2008. For those in other locations, Pissarro’s work is well represented in many museums (including 9 here in the Philadelphia Musuem of Art). You can find a list of museums containing his work on the Artcyclopedia site. I don’t know if the image shown here, “The Hermaitage at Pontoise“, is in the exhibition, but it’s one of his early paintings and illustrative of the transition from traditional landscape to Impressionism (plus, I just love it). The original is in the collection of the Guggenheim in New York. In addition to the multitude of individual artists’ styles in comics art, there are some very broad generalized categories, like the intense stylizations of Japanese manga, the anatomical exaggerations and dynamic action of American super hero comics, and the somewhat more restrained amalgam of styles that could loosely be called “European”, although practiced by comics artists in Europe, the UK, Scandinavia, South America, Australia and New Zealand. I’m particularly fond of the latter, which is often characterized by a more naturalistic portrayal of people than is usually found in mainstream American or Japanese comics. The figures are often loosely handled, with open line work and quick suggestions of details, and are commonly set against richly detailed backgrounds. That’s a pretty succinct description of the approach of one of my favorite artists working in the “European” style, New Zealander Colin Wilson (not to be confused with the well-known writer of The Outsider — if you do a Google search, use a qualifier like “comics”). Colin Wilson, the comics artist, started in his native New Zealand, where he published a comics fanzine called Strips, which included his work and that of several other artists, and is credited with helping to spark a comics revival in the country. He moved to the UK, where he worked for 2000AD on titles like Rogue Trooper and Judge Dredd, alongside such talents as Dave Gibbons, Brian Bolland and Mike McMahon. 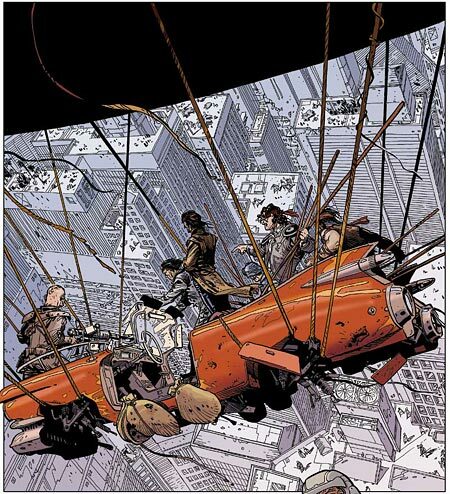 He later moved to France where he kept up his association with comics greats by working with Jean-Michel Charlier on on La Jeunesse de Blueberry (Young Blueberry), a spin off of the wonderful and immensely popular Lt. Blueberry series by Charlier and Jean (Moebius) Giraud (more on Giraud in a future post). Just before his stint on Blueberry, Wilson wrote and drew a series of comic albums called Real, Mantell and Alia, part of a series called Into the Shadow of the Sun. I first encountered Wilson’s work in a U.S. reprint of Rael from Acme Press/Eclipse Books (out of print). Wilson has done some work for the American comics market, including the Point Blank series for Wildstorm. Written by Ed Brubaker, who has been getting good bit of attention lately, Point Blank is not a superhero story, though it features characters from the established Wildstorm Universe, but more of a crime noir saga, a genre to which Wilson’s gritty and casual drawing style is an excellent fit. There is an interview with Wilson on Newsarama from around the time of that release. Since then he has worked with French Comics writer Maitz on another crime noir series in Europe, Du Plomb Dans La Tete (literally translated as “Lead in the Head”). Wilson has recently done more work for the American market: three issues of Star Wars: Legacy for Dark Horse, two of which just published (#9 and #10), the other of which should come out in the another month or so (#13). If you can’t find those, look for the Trade Paperback collection of Point Blank, or, even better, the Dark Horse printing of Rain Dogs (image above), a story originally printed in short chapters in 2000AD, and reprinted here in the U.S. in the style of a European graphic album: 48 pages, large format, great printing and no ads. Wilson has a blog, albeit infrequently updated, on which he posts artwork and talks about his projects and other items of interest. PJ Loughran is a busy guy. In addition to his career as an illustrator, creating his wonderful line and color illustrations for clients like The New York Times, Newsweek, Time, Sports Illustrated, Nike, Ford, Simon and Schuster and Harper Collins, he has served as the Design Director and Creative Director at the AGENCY.COM, and has recently founded his own firm, Kerosense Creative Services. If that weren’t enough, Loughran is a musician and songwriter, with two full length records to his credit and performances that have included opening for the likes of R.E.M, Taj Mahal, Todd Rundgren, REO SPeedwagon and the North Mississippi All-Stars. 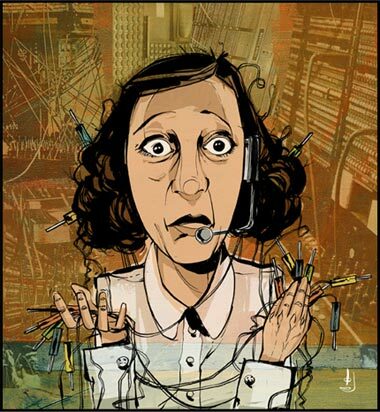 Oh yes, Loughran is also an adjunct professor at Parsons, teaching classes in web design, illustration and drawing, and has been a guest lecturer at a number of other art schools and universities. And I thought I had a busy schedule. While wearing his illustrator’s hat, Loughran has garnered recognition from The Art Directors Club of New York, Communication Arts Magazine, Print Magazine and the Society of Illustrators (more details here). His illustrations have a wonderfully loose, almost casual feeling, with lots of varied-weight to his ink lines, bright, freely-applied areas of color, interesting suggestions of texture and the frequent use of open, irregularly shaped compositions, in which the image is not constrained by a rectangle. He sometimes incorporates collage-like elements of photographs, colored and integrated with the drawings. There is an article about Loughran from a few years ago on the Adobe site that features a brief how-to for one of his sports themed images. 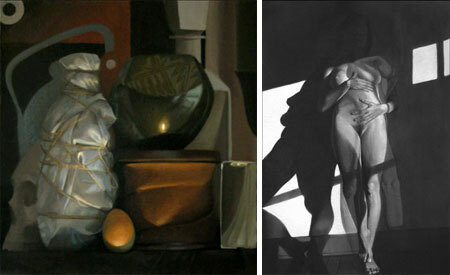 David Cunningham is a contemporary American realist painter originally from Tennessee and now living in Indianapolis. Cunningham practices a crisp, sharply focused realism, concentrating on still life and blending over into trompe l’oiel. His still life paintings begin with carefully arranged tableaux of personal objects, chosen both for personal meaning and, I would think, as a challenge the artist poses for himself to handle not only complex compositions but a variety of surfaces, colors, shapes and textures. It’s easy to miss the fact that there are additional galleries of still life on his site (linked with page-bottom text links) here and here. I doubt if Cunningham deliberately set out to work in trompe l’oiel, as it feels like a natural progression from his keenly observed and meticulously handled still life subjects. There is also a page of drawings, many of which, unfortunately, are not linked to larger images. I might wish for larger images all around, actually. It would be nice to see his precise handling of both drawing and painting media in more detail. Cunningham is also a professor of art at Franklin College, and there are some pages of drawings and paintings by his students posted on the site.